Take a close look at the North Korea war room photos. 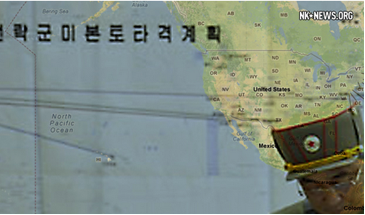 The maps showing the ballistic missile trajectories use a flat earth projection- straight in over the Pacific Ocean. 看起来的确有点奇怪，很多人也许有一个疑问，两点之间的最短距离轨迹不应该是连接他们之间的直线么,这大概成为了一种 common sense. 新浪微博 @盈川兄 转了这张图片，从底下的评论来看，还是有很多人的第一反应是：朝鲜的导弹路线是最近的.